Moved to My Own Domain!! Hey! Go on to my new site to see new recipes as well as all the old ones! I’m excited to be able to customize my blog even FURTHER! Please head on over to my new site domain to see the recipe! Awesome with crackers, bread, on sandwiches, or just by itself. You will love this recipe and so will everyone around you! I originally made this recipe to put on my absolute favorite sandwiches list (okay I understand I’m using the word “absolute” loosely since I have so many favorites). It’s a copycat Mediterranean Veggie sandwich from Panera Bread. For years I’ve wondered what they put on their sandwiches that make them so addicting. After reading up about it here, I found out that it was a version of jalapeño cilantro hummus. So I decided to make my own hummus. The combination of lime, jalapeño, and cilantro is a triple threat. Your tongue will be left with a slightly spicy yet citrusy taste after you eat a spoonful of this. For the recipe go to my new site! I was inspired to create this recipe when I was craving chicken lettuce wraps from California Pizza Kitchen. Except since I was temporarily vegan I needed to alter the recipe to substitute the chicken. So instead of chicken, I used the tempeh we had in our fridge. Tempeh is a vegan soy product that is another source of protein. It’s like tofu, but slightly drier and chewier. On its own, it is slightly sweeter than tofu and not as soft. It is made by fermenting cooked soybeans, whereas tofu is made by curdling hot soy milk. In this recipe, the tempeh is given more flavor by adding in the soy sauce. The sauce, which was inspired by The No Fuss Vegan, gives it a tangy citrus flavor with a hint of ginger. To assemble the lettuce wraps, layer on the rice, tempeh mixture, tomatoes, kale, and any other toppings you like. I recommend using iceberg lettuce as romaine lettuce is too skinny to hold all the fill-ins. This gluten-free dish is perfect for your family as it can be easily doubled or tripled, and it can be on your table in less than a half an hour! Once you taste this powerful flavor combo you will want to eat every last scrap off the plate! Please head over to my new site domain for the recipe! Be sure to check out my recipes on My Recipe Magic! I discovered something new today: Popped quinoa. At the grocery store I was looking through all the cereals when I came across a box of popped quinoa cereal. Crazy, right? So, I did a little bit more research and discovered that it isn’t hard to make it! It’s a vegan, gluten free extra crunch that you can eat on its own or add to a recipe like these homemade granola bars. Check it out here at my new domain! While preparing for high school soccer tryouts tomorrow, I looked around my house to see what snacks I could pack. I love eating granola bars before soccer practice because they are quick, easy, and give me a lot of energy. But we had none! So at the store instead of getting some more boxed ones (I love KIND, Kashi, etc. ), I decided to make the healthier alternative: my own. Packed with protein, this recipe is vegan and gluten-free. Perfect for a pre-practice or after school snack. See the recipe at my new domain! Now you read the title and were probably like how do you pronounce that? Bougatsa is a greek breakfast (or dessert) which resembles a creme custard pie (I know, PIE for breakfast, what is this madness? ) I have vivid memories each summer from sitting on the deck of my summer home or in the kitchen of my grandmother’s house eating this for breakfast before we went to the beach. There is also a cheese version, but my dad prefers the creme. So of course, we made the creme or “krema”. Another Friday means another pizza day. This vegan veggie pizza takes less than 20 minutes to make–probably faster than pizza delivery! For the crust you can use this recipe or crust you bought from the store. 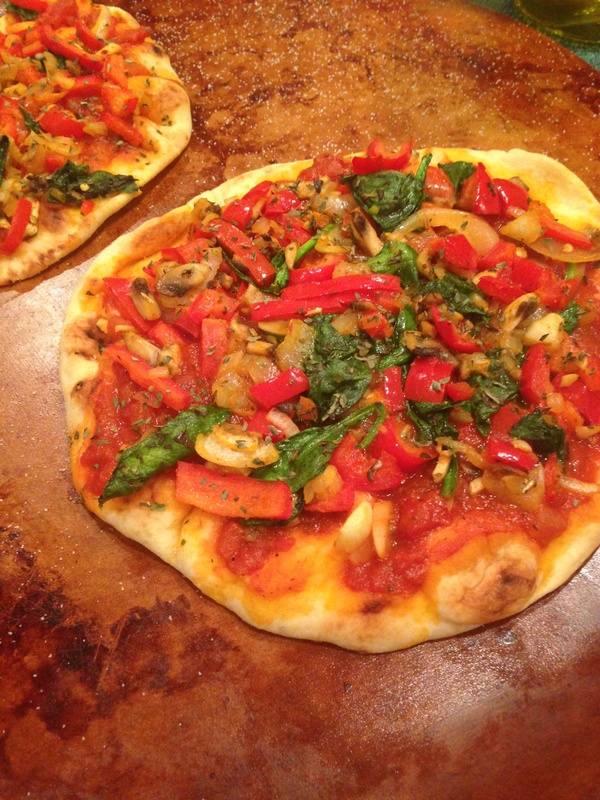 It doesn’t even have to be pizza crust– I used naan, so pita bread could work as well. You won’t be missing the cheese since this dish is loaded with veggies and has a slight spice due to the red pepper flakes. 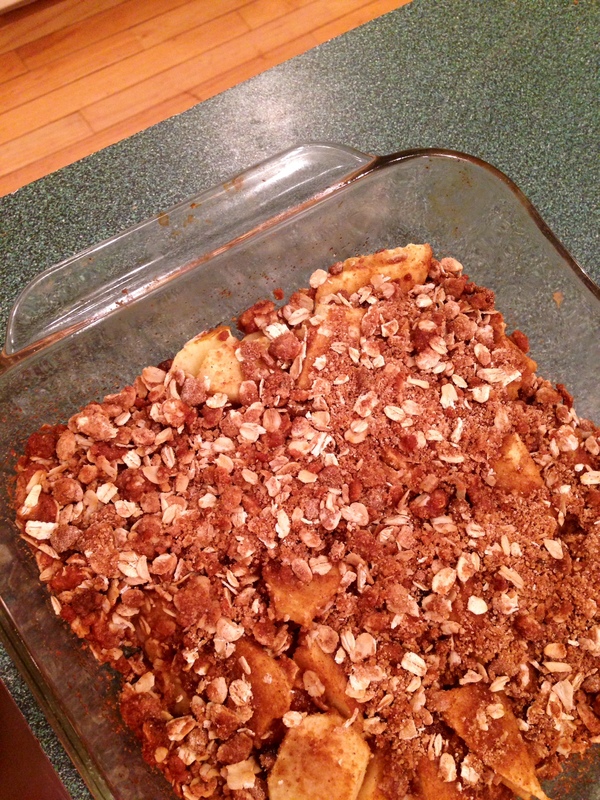 And for dessert try this vegan apple crisp or guilt-free cookies! Pre heat the oven to 425 degrees. Brush the crust lightly with oil and place on a baking sheet or pizza stone. Bake for 4 minutes. Take it out. Meanwhile, heat some olive oil on a medium pan over medium to high heat. Saute together the red peeper, mushrooms, onions, red pepper flakes, paprika, basil, oregano, and garlic powder, until the veggies are tender. In the last few minutes, add in the spinach. Note: if using fresh basil, add it onto the pizza. Don’t saute it. Divide and spread the tomato sauce on the crust. Place the veggies on top. Bake again for another 6-7 minutes. Can we please have a snow-day tomorrow? It is going to be subzero and I really just want to make bagels tomorrow morning. Or at least let the snow melt so soccer tryouts can be outdoors for once?!? Anyways, this is a super quick Mexican dish, perfect for a family of 4. Best part is, I had everything in my pantry to make this! This vegan, gluten-free dish takes 20 minutes and requires only one pan! The quinoa cooks in the pan, surrounded by assorted veggies and spices. The beans and quinoa offer a lot protein. It is slightly spicy and the hint of lime and cilantro make the dish complete. It’s an awesome and versatile recipe for a busy week night and you can mix up the veggies too! Start with sautéing the garlic and jalapeño in the olive oil in a large pan over medium to high heat. Add in the quinoa, broth, beans, tomatoes, corn, mushrooms, chili powder, cumin, salt, and pepper. Bring to boil, cover, then reduce to a simmer for 20 minutes. Stir in the avocado, lime juice, cilantro. Serve! Maybe I just really like quesadillas because I just posted another quesadilla recipe a few weeks ago… Or maybe they are just that good. Just like this black bean quesadilla recipe, this chicken pesto quesadilla recipe is awesome for lunch! I made this yesterday for me and my best friend before we made baked some epic pretzel cookies (recipe to come later). They take under 15 minutes to prepare and the flavors go together so nicely — from the melted cheese, to the grilled chicken, to the rich and creamy pesto. It reminds me of a typical sandwich you would order at an Italian restaurant. These are filling and can be made so many different ways; I topped mine with some avocado! Or you could add some bell pepper or even spinach inside the quesadilla. For the pesto, don’t worry, you can use pre-made pesto and it will still turn out terrific. 🙂 Even though I wished I had time to make pesto from scratch yesterday, I needed to make these quick (under 10 minutes ), so I settled for something I found at the grocery store. And when dicing the chicken, make sure you cut them small enough that they look like bite-sized pieces. They should easily be able to fit inside the quesadilla. Please head on over to my new site to see this recipe! 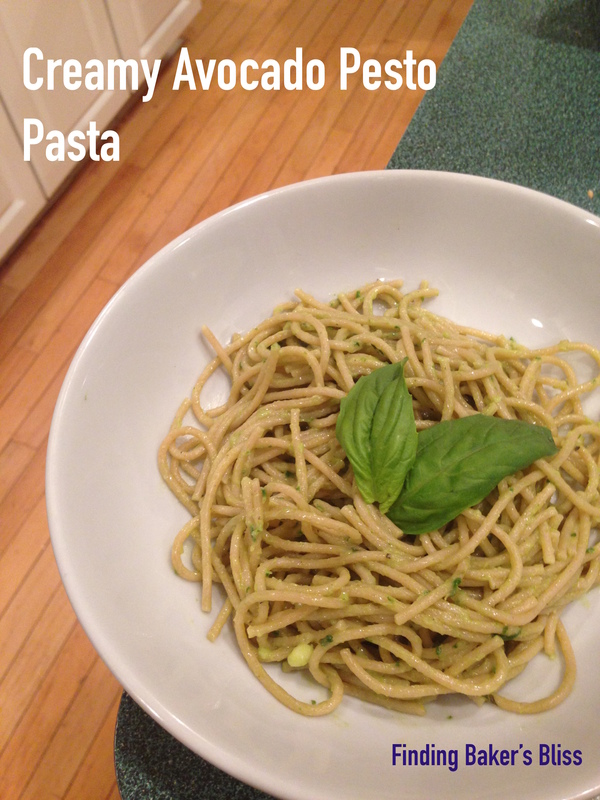 Check out my recipe on My Recipe Magic! and my Pinterest to stay updated with new stuff! Now these may look like ordinary cupcakes on the outside…. but they actually are pretty complex. And it was well worth the effort to see how many of my friends, especially her, enjoyed this sweet treat. But what was harder than even making the cupcakes or deciding what to bake her, was keeping it a secret from her. Although, thankfully, I think I thoroughly surprised her. The cupcake starts off with a JoJo cookie bottom. A JoJo, for some that may not know, is the Trader Joe’s version of the beloved Oreo. The cookies I got were actually stuffed with chocolate not the original vanilla- I didn’t know this until I had opened the box! But they worked out just as well as I had hoped. The next component is the dark chocolate cake. Then, it was filled with chocolate ganache. On top is a raspberry buttercream, decorated with some more ganache and a raspberry to make it look pretty. These are perfect for any chocolate lover or for those that you want to surprise with something sweet 🙂 Also, they are a perfect color combination for Valentine’s Day! Note: The icing is the texture that it is due to the fresh raspberry puree in the buttercream. The banana provides all the necessary sweetness a cookie requires and they smell so good when they are baking. And you could easily add in walnuts too-I didn’t have any on hand! And maybe I lied… these may have more than 3 ingredients, but I don’t count the salt or cinnamon. Ever since I was younger, my mom would make bulgogi (a Korean inspired beef recipe) for dinner a few times a month. This was definitely one of mine and my sister’s favorite dinners. So the other day, when we were looking for something to cook for lunch with the ground beef that we had, I thought of this dish. Typically, bulgogi is made with long strips of beef, but I adapted the recipe to be cooked with ground beef. It’s quick, tasty, and has an awesome flavor! Heat the oil and garlic in a pan over medium-high heat. Add in the meat, red pepper flakes, salt, pepper, and sugar. Cook the meat until it is browned (about 4-5 minutes). Add in the bell pepper, onion, and soy sauce. Cook for an additional 3 minutes. Serve on top of rice or quinoa! THESE ARE AWESOME. A great dish that is filling, healthy, full of protein and veggies! These quesadillas are great when you have some leftover quinoa. I found all these ingredients already in my pantry, and if you don’t have something, feel free to substitute it or take it out completely. This is probably my new favorite quesadilla recipe right now. The cumin and paprika add a little spice and makes you want to eat the filling just by itself! The crisp tortilla with the soft gooey melted cheese and the spicy topping makes for a perfect lunch. Make them as you would with a normal quesadilla. First heat the tortilla, flip it, lay on the cheese and filling, close the tortilla, and cook on both sides. Simple as that! Friday = Pizza Day. I think this is a known fact. I mean pizza day is everyday, but Friday is specifically for pizza. Maybe it’s because it is the end of the week, and everyone wants to relax and order some nice cheesy pizza. Or maybe it’s because pizza is just that good. And what better way to celebrate than to cook your own pizza? If you want to spruce up your homemade pizza and cut the carbs, look no further. This can be made within 30-40 minutes from start to finish and has a secret-ingredient for the crust: cauliflower. You won’t miss the typical crust at all! Just treat as a thin crust pizza and your whole family will love it! Make the recipes into personal pizzas, or one big pie. Put on your favorite toppings and enjoy! This past weekend, I went with my parents to drop off my sister at Princeton University. She’s an independent, meaning that she cooks for herself and is not on the university’s food plan. So with her little kitchenette, we decided to make some cookie layered turtle brownies. Shopping on a college budget. First off, in the store when deciding between different brands, instead of getting the highest quality (and usually most expensive) ingredients like I do at home, my sister told me to “get the cheapest since we are on a college budget.” We also had to be mindful of the ingredients we used– so I did something I rarely do and used box mix for the brownies (she had boxes of them at her dorm already) and pre-made cookie dough (GASP!) . At home, I like to splurge on high quality chocolate and even good vanilla with Madagascar bourbon, because I think they affect the taste. However, you can bake with anything and the treats will still turn out good. No counter space and limited utensils! When we got to her dorm, I had to work with 2 feet of counter space, two bowls, and a spoon. Compare this to the island and the insane number of pots and pans I have at home, and it doesn’t seem like much. Yet, it worked out perfectly. College students = hungry students. The last thing I learned is that college students like food. Real, sugary, yummy foods and they want it in its full glory. So these brownies were perfect for them. To do this at home, you can easily substitute homemade cookie dough and brownie batter. I definitely under baked them and when they were cooled they were rich and scrumptious. Note: If you are buying a box mix, try to look for one that suits a 13 x 9 pan, as this recipe calls for it. Else, adjust the recipe as needed to fit your pan size. To make the brownie box mix better, add in some vanilla and chocolate chips! So why not celebrate the four day weekend with crepes? My favorite crepes are the ones filled with Nutella and strawberries and bananas and blueberries. But today, my sister and I came up with the brilliant idea to put Nutella inside the crepe batter. Our own invention. We started out with the intention of making Nutella crepes, but halfway through baking we kind of created these Nutella banana quesadilla things because they were pretty hard to flip. First, I created a recipe from scratch. A veganish, healthish recipe. Once I made the batter, I experimented different ways to cook and to flip the crepe. I got halfway through the batter until we discovered the best way to make them: into quesadillas. Note: The crepes are hard to flip! So I made this with the intention of being vegan, but since Nutella does contain milk, to make it “truly vegan”, you can substitute a vegan version of Nutella. There are a lot of ways you can make this recipe simpler– like just adding 1 cup flour instead of adding the almond meal, oats, and flour. Combine all the ingredients in a food processor and pulse until everything is combined. You can either chill the batter for 30 minutes or go straight to cooking them. Preheat a pan greased with cooking spray over medium-high heat. Cut thin rounds of banana. Pour a little bit of batter on to the pan, and tilt the pan around to thin out the batter. Cook for 1 minute. Add the bananas and some powdered sugar to one side of the crepe. Flip over the other side, and cook for an additional 20 seconds. Then flip it over again and cook again for 20 seconds. Repeat until the batter is done! Serve with powdered sugar and any fresh fruit your heart desires! After two hours of dancing (hip hop and zumba), my sister and I decided to treat ourselves to some dessert… warm, gooey apple crisp. I made it. I baked it. Then it was gone. The whole pan was literally devoured seconds after I took it out of the oven (thanks to my family, but mostly me…whoops). Even though you might associate apple recipes with the fall time–I don’t! Apples are one of my many favorite fruits because they are just soooo delicious. And if you never tried apple crisp– you definitely are missing out! The soft baked apples with the crispy sugary oat topping is to die for! Try eating it with some greek yogurt or a nice big scoop of rich vanilla ice cream. Yum! Best part is, this recipe does NOT contain butter and is vegan! About this recipe: I mention adding pinches of salt and nutmeg. This is based on your discretion depending on how much you like the flavor. I probably used 1/8 of a teaspoon for both the nutmeg and salt. Don’t worry if you don’t have dark brown sugar, light brown sugar will suffice! Preheat the oven to 375. Grease an 8×8 pan with coconut oil. Lay the the apples in a layer across the bottom of the pan. In a medium bowl, mix the other ingredients with your hands or with a spoon until the mixture is crumbly. Sprinkle evenly on the apples. Bake for 30 minutes and serve with a topping of your choice(like yogurt or ice cream). When my sister is home, we make all of her favorite foods (as you can see by the previous posts here and here). She loves avocado. And basil. And I love lemon and lime, so this dish was a perfect medley for us! And it surely a way to spruce up pesto sauce (even though that is just wonderful in its original form). It took 15 minutes tops, and we added in some cooked shrimp. Feel free to add cheese too! The vegan sauce is light yet creamy and not to mention that it contains the superfood avocado! Note: Don’t blame me if there are no more avocados at the store…..It’s not my fault. Bring a large pot of water to boil and cook the pasta based on the package’s directions. While the pasta is cooking, prepare the sauce. In a food processor or a VitaMix, finely chop the basil and garlic cloves. Add in the water, oil, lemon juice, avocado, and lime juice by pulsing. Next stir in the oregano and salt and pepper. Once the pasta is drained and cooked, put it back into the pot. Add in the sauce and stir until the pasta is evenly coated. Add in any cheese and protein you might like and serve! My sister is a lover of sweets. So, at the grocery store yesterday,when we were getting ingredients for dinner, we stopped by the baking aisle as well. That’s when we saw rows and rows of brownie mixes and decided we needed to whip up some ourselves. Of course, we didn’t get the box mix, but we used it as inspiration for this idea we found on Pinterest. Rich, fudgy chocolate brownie + peanut butter topping + chopped chocolate covered pretzels + marshmallows. If you are looking for an easier version of this recipe (that requires less effort), have no fear– you can used prepackaged chocolate covered pretzels and box brownie mix. Of course, I always say go with the homemade way. Don’t worry if you don’t cover the pretzels all the way, they will eventually be crushed up. When you are done with the whole process, store them in the fridge to keep the frosting and chocolate pretzels chilled. The peanut butter frosting is supposed to be thick and is only made of butter, peanut butter, and confectioner’s sugar. You can add the confectioner’s sugar as needed to get a good consistency. Did I mention these are awesome? Peanut buttery goodness on top of a rich, fudgy brownie. You must try! Make the pretzels so the chocolate can cool! Melt the 5 oz of chocolate chips in the microwave in increments of 10-30 seconds on medium power. Stir after each interval until the melted chocolate it smooth. Mix in the pretzels and try to coat them evenly. Place on sheet of parchment and store in the freezer in order for the chocolate to harden. Next up: the brownie batter. Preheat the oven to 350 degrees. Prepare a 13×9 pan (or a smaller pan if you want thicker brownies) with cooking spray. Brown 1 stick o f butter in a small saucepan over medium to high heat. Turn the heat to low, just as the butter has brown specks and add in the chocolate to melt. Stir until the chocolate is all melted. Move the mixture into the bowl of the stand mixer and allow to cool slightly. Add in the sugar and stir until well incorporated. In a separate bowl, whip the eggs. Add them into the chocolate mixture, a little bit at a time. Stir in the vanilla. Add in the salt and flour, and mix until the mixture is evenly mixed. Scrape the sides of the bowl with a spatula as needed. Pour the batter into the prepared pan and bake for 28-30 minutes, or until the toothpick comes out almost clean. Allow to cool completely before add the frosting. To make the frosting: Combine the peanut butter and butter in the stand mixer. Using the whisk attachment, whip the mixture until you can’t see butter pieces and it becomes a light brown color. Add in the sugar. The frosting should be thick, if it needs to be thickened, add in more sugar(up to .5 cups more). Once the brownies are cooled, smooth the frosting over the brownies. Coarsely chop the chocolate covered pretzels and sprinkle evenly on top of the frosting. Add on the marshmallows and place in the fridge for another 30-60 minutes. Using a plastic bag and a rolling pin, smash the crackers into fine crumbs. add in the sweetener, cinnamon, and nutmeg. Mix well with almond butter and water to form a sticky consistency. Place in a ramekin. Next, smooth the yogurt on top. Place the blueberries on top and chill for 20 minutes before eating. My sister loves blueberry bagels. Especially topped with bright pink strawberry cream cheese. So in honor of her week off before her next semester, and as a stress reliever for my own midterm week I decided to make my very own bagels for the first time ever. The recipe below says to place the bagels into boiling water. This is because it provides that tough crust which bagels have, while still preserving the soft and fluffy inside. 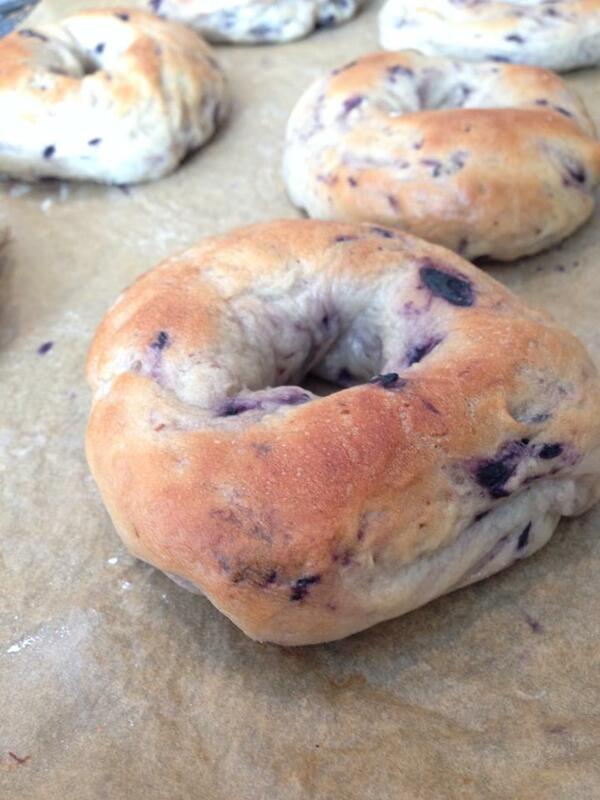 If I were to redo this recipe, I would definitely add more blueberries to make the bagels look more purple! I also tried to make strawberry cream cheese, but failed. I think it might have been the cream cheese I used or that I didn’t use fresh strawberries. Nevertheless, it was great having fresh bagels out of the oven on a morning of a snow day! To proof the yeast, dissolve the yeast, sugar, and 1/2 cup of the water in a small bowl by mixing. Let it sit for another 5 minutes. Combine the salt and flour well in a bowl. Make a well in the center to add in the yeast and the rest of the water. Next, add in the blueberries. Knead it until the dough is a soft, elastic, ball , either with your hands or with the dough attachment of the stand mixer. Cover and let it sit in a warm place for 1 hour. On a floured surface, divide the dough into 8 balls. Create a bagel shape for each ball by forming a hole in the center. Let it rest for another 20 minutes. In those 20 minutes, preheat the oven to 425 degrees F. Let a large pot of water come to a boil. Place each bagel (2-3 at a time) in the water for 2 minutes. They are ready when they float up to the surface. Place on a baking sheet with parchment and bake for 20 minutes. Best bread ever. I repeat. BEST. BREAD. EVER. Okay, so normally pita bread is my favorite( blame my Greek roots) bread, but this is pretty damn close. Everything about it is perfect. Its crispy on the outside, fluffy on the inside, and is just plain out amazing. Also it’s National Cheese Day and this pairs insanely well with cheese! I’m planning on keeping one of these flatbreads for a sandwich tomorrow. This takes me back to summers in Greece when they always serve pita with everything. Instead of a baguette, it would be pita. And the way they grilled it and seasoned it, to die for! You must try this recipe! it takes less than a half an hour since this doesn’t involve yeast–meaning none of that boring rising time! Plus, it is vegan! Use it as a pizza crust, or for a flatbread sandwich, or just to much on! When I was heating the pan, I used coconut oil for the first 4 pitas and then switched olive oil. Both are tasty! You could also try a 1/1 whole wheat/all purpose flour ratio or sprinkling with oregano! Combine all the ingredients in a stand mixer with a dough attachment, except for the oil for greasing the pan. Mix until a dough ball forms. The dough should be soft and stick together. If sticky, add more flour. Cut into 8 pieces. On a floured surface, roll out each individual ball into 5-6 inch pitas. Preheat a cast iron pan over medium-high heat with coconut oil or olive oil. Cook each individual pita for 1-2 minutes, or until it starts to bubble. Sprinkle with salt and pepper and flip and cook again for 1-2 minutes until ready. Place on a plate with a dish towel to cover to keep warm. Repeat until all pitas are done. Enter your email address to follow this blog and receive notifications of new recipes!